Where to start? The beautiful outfit is from MichaMi. I was looking for a contrasting color for fun when I saw this purse from SLink. The bags have been out for a while but the pinks are new and I love the shades. The jewelry is from Eolande. I comes in different metals and the gems are color-change. The shoes are new from Shiny Things. They’re very simple but they come in some great colors. Just because we’re entering Fall doesn’t mean we have to give up our beloved summer clothes. I’ve paired this skirt and flirty top with tights, the button boots and socks from Shiny Things (want these IRL soooo badly) and a jacket from Luminosity. Also one of the new skins from Chai. No, you haven’t heard the last about these boots yet. I’m totally in love. These tights just popped in my head when I was contemplating the black and cream version. The rest fell into place from there. LaLa FooFoo has released new sweaters that are great for early Fall. Shoes from Shiny Things (yes, I do have shoes from other people ;-).) Belt from Kari. 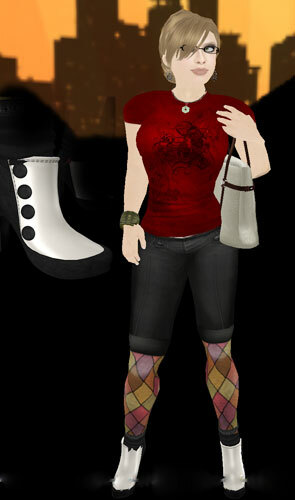 You are currently browsing the Fallingwater Cellardoor – Shiny Things category at SL Fashion Notes.